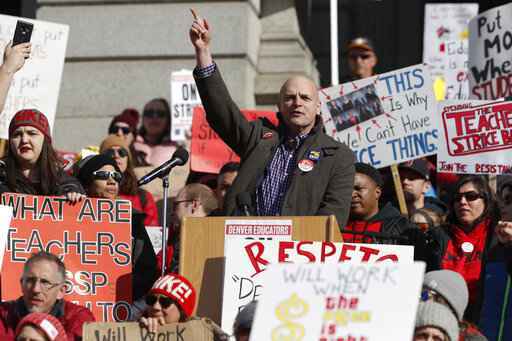 DENVER (AP) — Striking Denver teachers wearing red packed a library meeting room Tuesday for a public negotiating session with district leaders on the second day of a strike over pay. The meeting, facilitated by a federal mediator, was the first time the sides met since talks broke down over the weekend. Lead union negotiator Rob Gould interrupted to tell her "You can't do the job without us."